We now come back to a BWT water filter pitcher which is rather similar to the one we already reviewed. But this time we are looking at a cheaper version and this reason alone might make the jug more attractive to users. The good thing is that you still get all the award-winning technologies that BWT has along with the advanced filtration system which doesn’t require pre-soaking. The water filter pitcher will also enhance your water with magnesium and will definitely bring that natural taste of water. All of these things are absolutely inherent to BWT filter jugs. As far as the number of cups from one full pitcher goes, there isn’t an exact answer. According to some fellas, you can get about 8 cups out of it but others claim that the number is smaller than that. It is obvious that people from different countries measure the capacity using different cups from one another. The difficulties are highlighted also by the fact that not everyone uses the same measuring unit. 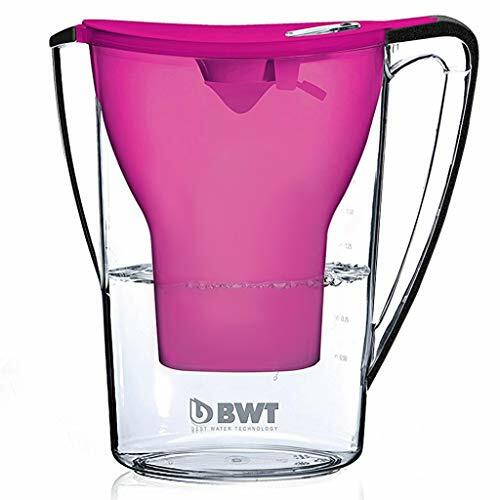 The plastic of this BWT water filter pitcher is completely BPA free but we shouldn’t expect anything less, should we? All the standards for clean craftsmanship are covered and every regulation is fully implemented. Even though the filtration system is pretty thorough it should take about 30 seconds to obtain a full jug of clean water. Such performance is quite impressive as most competitor brands in this sector achieve the same effect for double the time. As good as the BWT filtration system is, it still wouldn’t remove fluoride from water. Fortunately, not many areas in the world have such issues with their tap water locally. You can watch what happened in Pittsburg here. 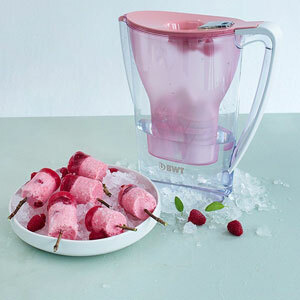 When it comes to the color of the product, you do not have much choice – it’s pink. Such a characteristic is typically rendered as a disadvantage because the color can be too demanding. The average life of one of these BWT filters is about 100 fills or 40 gallons of water. Unfortunately, you cannot expect this water filter pitcher to wow you with an unexpectedly long filter life. These numbers are completely common and we are yet to see somebody make more advanced water filters. Next comes the typical BWT black particles problem. It turns out that most, if not all, BWT filters will release some sort of little black bits into the water the first time you use them. According to the instructions you have to thoroughly clean the whole jug before using it for the first time and then throw away the two first full pitchers. If the issue persists, then you obviously have problems with the filter as it may be even cracked. Whatever the case, it is pretty uncomfortable having to take apart, clean, fill 2 times and only then use your water filter pitcher. A speedier preparation would be much appreciated by users for sure. Additionally, the spout isn’t the best. Even if you are very careful with how you pour water, there will still be some dribbling down the side. Nobody wants to make a mess when drinking a cup of water but this often happens here. The counter for the remaining life of the filter is a great accessory and a much-needed one. However, the construction isn’t the best and some water can get in there. This will cause the counter to malfunction and you will no longer be able to track the life of your filter. Does not filter out fluoride. © 2019 Water Filter Pitcher Reviews. All Rights Reserved. All Rights Reserved. waterfilterpitcher.reviews is a participant in the Amazon Services LLC Associates Program, an affiliate advertising program designed to provide a means for sites to earn advertising fees by advertising and linking to amazon.com.